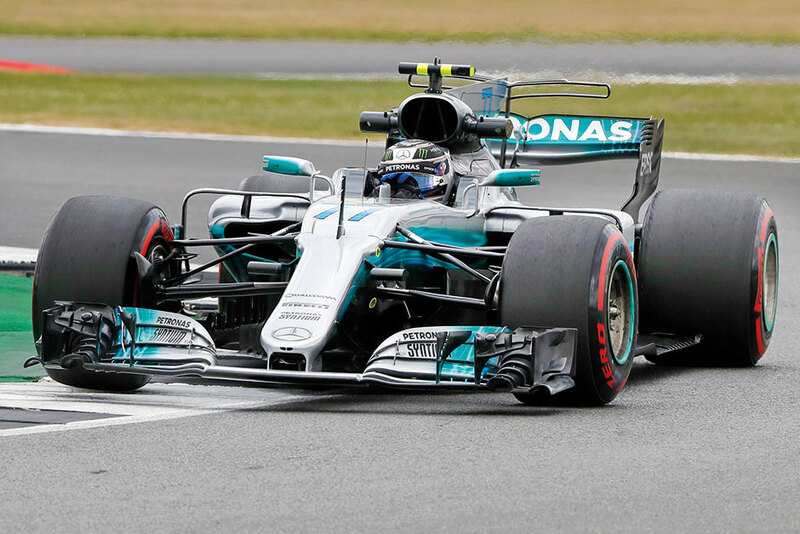 Silverstone: In-form Valtteri Bottas registered a ‘double top’ ahead of Mercedes teammate Lewis Hamilton to confirm his title credentials in Friday’s opening practice sessions ahead of this weekend’s British Grand Prix. The Finn, who joined the team as a replacement for retired 2016 world champion Nico Rosberg, emerged as a genuine championship contender when he won last Sunday’s Austrian race. His current consistency has made him the highest points-scorer over the last four races while Hamilton, who trails championship leader Sebastian Vettel of Ferrari by 20 points, has battled unexpected setbacks and misfortunes. Bottas clocked a best lap of one minute and 28.496 seconds to outpace Hamilton by 0.047 seconds at the top of the timesheets in the afternoon’s second session, with the Ferraris of Finn Kimi Raikkonen and Vettel third and fourth. Dutchman Max Verstappen was fifth ahead of his Red Bull teammate Daniel Ricciardo, German Nico Hulkenberg of Renault and Felipe Massa of Williams. Verstappen said he was disappointed to see Red Bull trailing Ferrari again. But not surprised. Two-time champion Fernando Alonso was ninth for McLaren ahead of Frenchman Esteban Ocon of Force India. Hamilton set his time using ‘soft’ tyres while all his rivals in the top ten clocked their best laps using ‘super-soft’ tyres, a feat that suggests the three-time world champion, who is seeking a record-equalling fifth British win, has plenty of performance in reserve. The session was run in cool and overcast conditions, presenting a challenge to the teams to work warmth into their front tyres particularly. 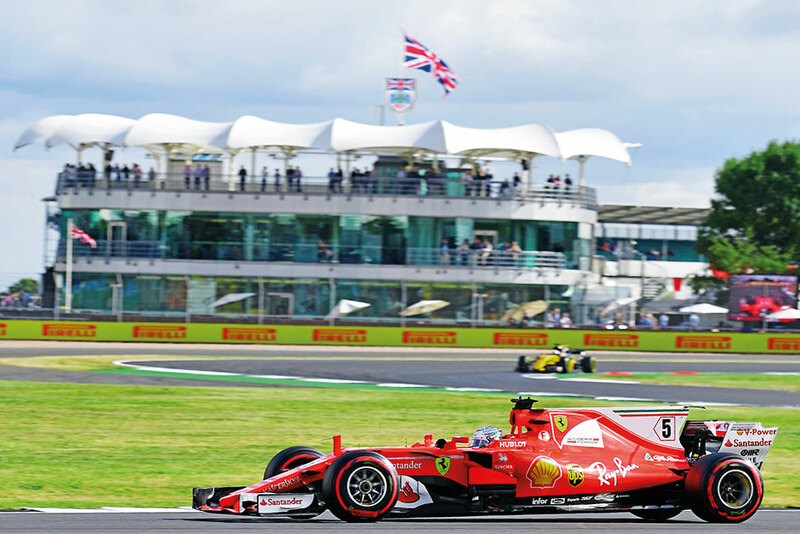 In this respect, Mercedes looked to have mastered the challenge while Ferrari, who were running in new engines, appeared to be finding it more difficult. In the conditions, it was surprising that there were no major incidents, but several drivers made unscheduled off-circuit excursions — the most spectacular delivered by Carlos Sainz in his Toro Rosso and later from Brazilian Massa, who had a big ‘off’ at Becketts. Vettel turned heads when he drove behind a transparent screen in first practice as the Formula One championship leader trialed a new device intended to provide greater head protection. The polycarbonate shield, placed on Vettel’s Ferrari for the first time, is designed to protect against flying debris while offering an unrestricted view. Motorsport’s governing body FIA is looking at ways to improve cockpit protection and limit the risk of head injuries, after French F1 driver Jules Bianchi died in July 2015 and British IndyCar driver Justin Wilson died a month later. The FIA previously tried out a metal frame known as the “halo,” which is intended to stop loose wheels — or other flying debris — hitting a driver’s head, but it was criticised by some drivers on aesthetic grounds.